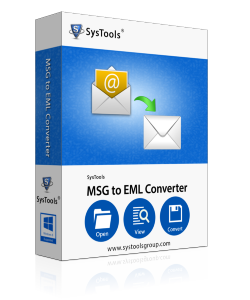 It is possible to add multiple MSG files on the tool and convert it into EML format. You can add and list several MSG files one by one on the software. Browse the MSG files from their respective location within your machine. Once you add the MSG files, software will list them one by one. Along with this, it will show you the associated properties of MSG file i.e. ; email sent from, subject of email, the location of file. Also, you can sort and re-arrange the list as per the attributes associated with it. While converting MSG files into EML, software retains the complete Meta data. The complete formatting of emails, hyperlinks, To, Cc, Bcc, and etc. ; will be retained even after conversion into EML file. Also, the software will embed email attachments within EML files post its conversion. With the MSG to EML file conversion tool, you can open and read emails in multiple emailing applications that support EML files. There are number of emails clients that support EML files such as Outlook Express, Windows Mail, Windows Live Mail, Thunderbird, etc. Complete software options & commands for the conversion of MSG files into EML format is integrated on a single panel of the tool. There is no need to execute complex navigations or selections on multiple screens to save multiple MSG files as EML. After adding and listing all MS Outlook MSG files, the software will prompt you to choose the location for saving converted EML files. You can select any target location of your choice to save output EML files or directly make a new folder from software panel itself. 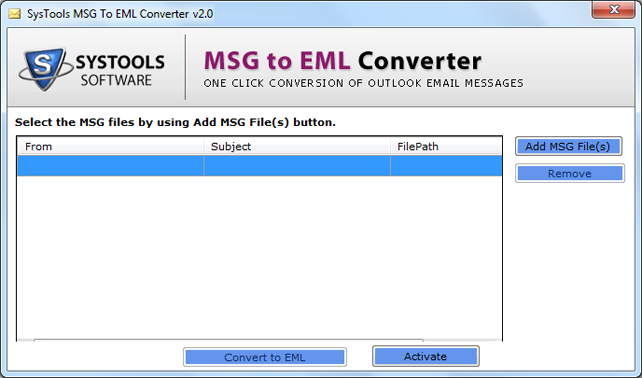 Demo version of MSG to EML Converter software converts first 5 MSG files of MS Outlook to EML file format of Outlook Express / Windows live mail etc. Microsoft Windows – Win 10/8/7/ Vista and Below Versions of (32-bit & 64-bit). Can I use the software on mac machine? No, you can install the tool on a mac machine. The software is a windows based tool and can be installed on windows 8 & below versions of OS. How to Transfer MSG File into EML File Format? Does your software requires MS Outlook installation for the conversion? No, Our tool is a standalone utility to transfer MSG files to EML format. There is no need of any supportive program to carry out conversion with this application. Is this tool converting MSG emails to EML with their respective attachments? 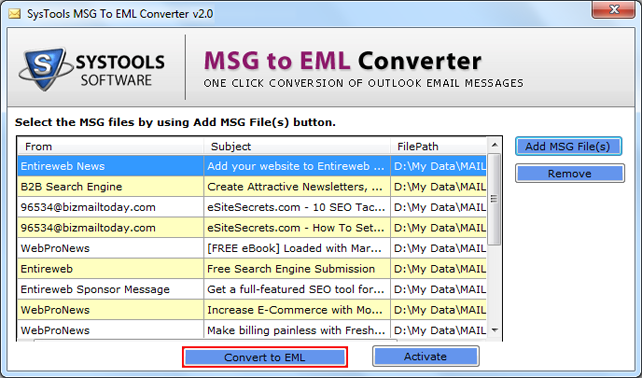 Yes, off course, our MSG to EML Converter not only supports emails with attachments but, also converts them in .eml format. You are not going to comprise even a single change in existing email either it is regarding technical properties or attachments. "We are highly obliged to be able to find out about this absolutely fabulous tool and also be able to use. A specific number of emails were dragged out from my Outlook client to switch into a much easily available client like Thunderbird, for its free of cost accessibility." "I had decided to move out of my Microsoft Outlook 2003 client but wanted some other reliable client that I can trust on. And what other could be better than the one from Windows itself. So, I chose to switch my MSG to EML to be able to use Windows Live Mail." "I was having bulk of MSG files with me and I wanted to move them all in EML file format. I tried to perform task manually but, doing this with more than 1000 files was tedious. Therefore, I looked for a third party software and luckily, came across this MSG to EML Converter. It rapidly exported all .msg files into Outlook within a blink of the eye and with zero data loss all my task was accomplished." "It is not at all possible for me to convert MSG to EML in bulk. There were several folders having numerous numbers of MSG files within it. 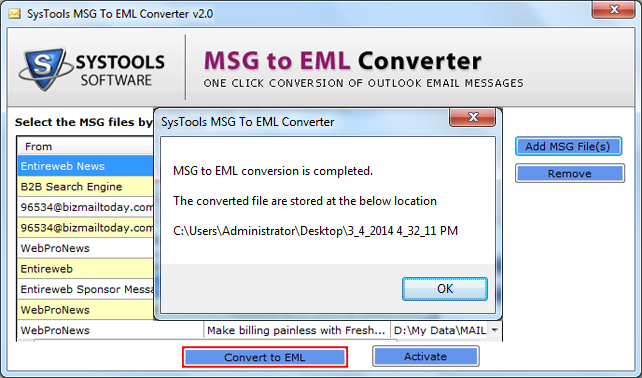 Therefore, I utilized this SysTools MSG to EML Converter and attempt the same. This application is quite easy-to-understand due to which I did not have to face any difficulties related to technical background. Heartily thanks to the development team!"